What has this book got to go with paleoanthropology? The short answer is ‘not one tiny bit’. But it has everything to do with stress, communication and change especially for the modern Caveman. We all live busy, stressful lives but fortunately we all possess the ability to shape and mould our future. The only person who holds ‘us’ back, is ourselves. We can blame others, our boss, our wife/husband or even the kids but ultimately we are the only person who can change our lives. I developed The Caveman Principles to make my own life better and I know that they will help you as well. The book has been written to share my Caveman theories in an easy to read guide. You can follow them and improve your own life. You have the power to make the choice, to want better relationships, manage change easily and more importantly reduce your own stress. I hope you embrace the Caveman Principles and ﬁnd them useful. The best stress book ever written. 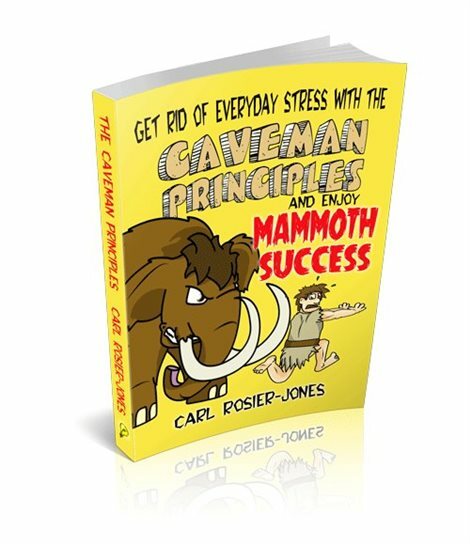 The Caveman Principles was written for people who suffer from everyday stress. With an in-depth look at the causes of stress and helpful insights into relationships, plus how to create mammoth success by making personal changes happen.